The weapons of tomorrow will be powerful beyond imagination. The Vietnam War began in 1955 and wouldn’t see its conclusion until 1975. One can only imagine the number of weapons used over the twenty years before the conflict came to an end. Yet one weapon in particular — used by the United States — didn’t utilize fire or gunpowder to do damage. All it needed was gravity and a bit of metal. Dubbed “Lazy Dog” bombs, these kinetic weapons were small, missile-shaped tubes of metal about 2 inches in length and less than an inch in diameter. Outfitted with fins, they would be dropped by the hundreds on U.S. enemies, who were almost certainly ill-prepared for such a bombardment. As reported by We Are The Mighty, these Lazy Dog bombs would be dropped by planes from thousands of feet in the air, and would reach speeds up to 500 mph. From a height of 3,000 feet, they’d be capable of punching a 9-inch-deep hole into concrete. Needless to say, you wouldn’t want to be hit by one. Lazy Dogs bombs don’t have a monopoly on this concept; if you want to count weapons that simply relied on gravity, look no further than the trebuchet. Task & Purpose writes that U.S. Army veteran and Boeing enginner Jerry Pournelle also had a similar idea, though his involved using longer pieces of metal, and dropping them from sub-orbital heights. Interestingly enough, Pournelle had these thoughts in the 1950s, in the early years of the Vietnam War. Pournelle’s idea came to have the name “Project Thor,” though it was eventually given the much more menacing title of “rods from god.” Regardless of the name used, the potential destruction was enormous. As explained by Popular Science, the rods from god were tungsten rods made to be nearly 20 feet in length and a foot in diameter. A pair of satellites would be placed thousands of miles above the earth, with one controlling the targeting and communications, while the other would carry an untold number of rods. Starting with those on the ground monitoring and controlling the satellites, and ending with the rods’ impact, the whole ordeal could play out within 15 minutes. The rods from god could achieve speeds multiple time the speed of sound; the nine inches of penetration the lazy dog bombs could achieve pales in comparison to hundreds of feet their larger counterparts could travel. Best of all? Project Thor could impact with the force of a nuclear weapon, without the nuclear fallout that would affect the surrounding environment and any people unfortunate enough to be there. 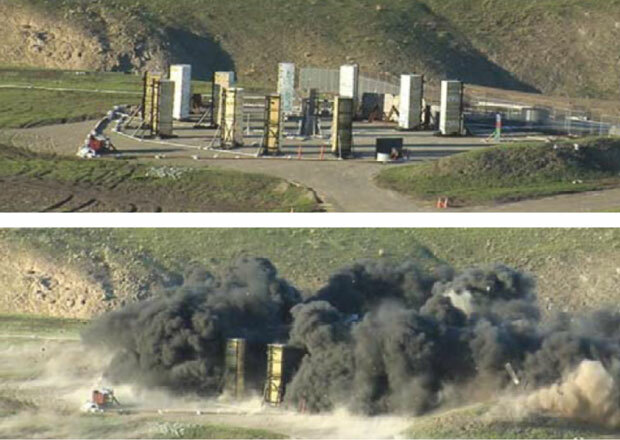 Speaking to Task & Purpose, Matt Weingart, weapons program development manager at Lawrence Livermore, explained that while a traditional bomb relies on chemical explosives to do damage, kinetic weapons only need speed and mass. It’s unclear how much money the U.S. military might save from switching to kinetic weapons, as well as just how far away we are from practical applications of kinetic weaponry in real world scenarios. Yet at the rate that technology is advancing, it’s only a matter of time before we incorporate space into warfare, and likely find new ways to increase the power of our weaponry as we do.